Recently we read reports in all media that contrary to the initial “prima facie” reports, the meat found at Dadri was indeed beef or rather more specifically: “of cow or its progeny”. 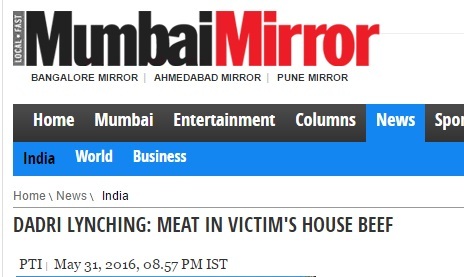 While the nature of the meat does not take anything away from the fact that a very gruesome and vile crime occurred in Dadri, the reporting of the latest twist indeed warrants scrutiny. If reports in media houses such as India Today, Hindustan Times, Mumbai Mirror (which is based on a PTI report), Deccan Chronicle, Times of India (based on a ANI report), The Hindu and ABP News are to be believed then the meat was found in Akhlaq’s home or refrigerator. But as we see news reports from Economic Times, Times of India (a TNN report) and NDTV we are told that the meat was not from Akhalaq’s house, but was found in a garbage dump / dustbin / tri-junction near Akhlaq’s house. The Times of India report bases this theory on the version of an unnamed “senior UP Police officer” while the Economic Times says that they obtained a copy of the seizure memo prepared by the UP Police on the day of the incident which confirmed that the sample was taken from meat found by sub-inspector Tej Pal Singh from a “tri-junction near a transformer“ in the village. If one goes back to the earlier reports from December, which had “prima facie” declared the meat to be mutton, they too indicated that the meat was sourced from inside Akhlaq’s house. (1, 2, 3, 4, 5). Even media reports from just days after the incident, which mentioned that the meat had been sent for testing, said that the meat “which was consumed” or which was from the fridge of Akhlaq, had been sent for testing. (1, 2, 3, 4, 5). One cannot find the mention of any dustbin or dump in these reports. The handwritten note which specifies the nature of the meat also makes no mention of the source of the meat, hence it is indeed intriguing as to how the media has found out the source of the meat. This small detail changes the complexion of the case, because if the meat was in Akhlaq’s house then there can be a claim that there was a genuine reason for the anger of the villagers (although it doesn’t justify a murder). And on the other hand if the meat was from outside Akhlaq’s house, then a claim can be made that either Akhlaq threw away the meat, or worse, it was planted by someone to “frame” Akhlaq. In this situation it is bewildering how at the time when the meat was sent for testing and at the time when based on prima facie tests, the meat was said to be mutton, all media reports were unanimous in saying that the meat was indeed from Akhlaq’s house, but now as soon as the final report says it was in fact beef, a few reports carry a new found piece of information that the meat was not sourced from Akhlaq’s house. Was the media getting it wrong all this while and have they suddenly got the right information? Or is this new information a cover up? Irrespective of what the meat was, Akhlaq must get justice and his murderers must be punished in the most severe manner. Meanwhile, the search for the facts regarding this aspect must continue. The police has also lodged two separate FIRs in the current case, one against the alleged cattle slaughter and another against the protests which followed.